Your printing account can be accessed at: https://papercut.balliol.ox.ac.uk and uses your SSO credentials for access. FYI: These credentials are what are used to access Nexus email. There is also a mobile version of the site: https://papercut.balliol.ox.ac.uk/client. 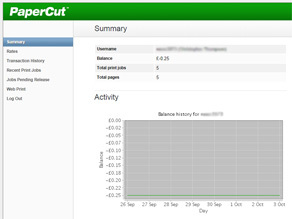 Here you can view your current balance, recent print jobs and release held print jobs. We have two high-quality multifunction printers: one in Staircase III in the Computer Suite and one in the Holywell Manor Computer Room. These multifunction printers are capable of printing, copying, scanning to email addresses and printing from USB media. The workstations at each location print directly to those printers. It is also possible to print Microsoft Word, Excel and Powerpoint documents, PDF and XPS files from any computer by uploading them with a web browser via https://papercut.balliol.ox.ac.uk. A user guide for these printers is included at the bottom of this page. All laser printing is charged directly to battels. Please see table below for current charges. The printers are set to print double-sided by default. The first £1 of printing per term is paid for by the Senior Tutor. College provides the paper and will not make a reduction if you use your own paper. We do not advocate using your own paper in the printer; if nothing else you cannot guarantee that your job will be the next one out. If your paper is substandard and damages the printers, we may require recompense. As an example, if sticky labels ruin the toner drum a replacement is ~£200. If the printers go mad, or run out of toner and produce useless output, you should request a refund through your printing account via https://papercut.balliol.ox.ac.uk. To request a refund, log into your printing account and click on ‘Recent Print Jobs’. Find the job you require a refund for and click on ‘request refund’. Fill in the form detailing the refund amount and the reason for the request. Please allow two working days for a refund request to be processed. You must enter in a valid reason for requesting a refund; otherwise College reserves the right to deny the refund request. Login to https://papercut.balliol.ox.ac.uk, where you can view your recent print jobs and request a partial refund for that particular job. You must enter in a valid reason for requesting a refund; otherwise College reserves the right to deny the refund request. We generally make an adjustment to the charge depending on where the error lies. In the Broad Street main site contact the ICT Department. In Holywell contact a lodge staff person in the first instance, then the ICT Department. In Balliol main site contact the ICT Department. In the evenings spare reams of paper can be signed out from the Porters’ Lodge. There are instructions at the printer station on how to change the toner cartridges, or instructions are in the box - primarily note that there is a tape you have to pull out before installation! In Holywell fresh paper can be obtained from the Lodge. If the toner has expired, take the empty cartridge to the Lodge to swap for a new one. The ordering of toner and paper is handled by Holywell. The ICT Department does not hold spare toner cartridges. Installation instructions are in the box - primarily note that there is a tape you have to pull out before installation!